There are times in prayer when you just don't have any words. Your heart is crying out, your eyes are swollen with tears but your throat is dry. These are the times I believe when the Holy Spirit prays through us. It is so comforting to know that as we come to God; giving him our situation, our burdens, our loved ones, our lives, he intercedes for us. Jesus...himself intercedes for us! He lives to intercede for us. As I was reading these words I felt his peace pervade my soul and his presence so close. I pray that you will experience the same as you read these words of life also. Whatever you are going through, whoever is on your heart; take hold of these truths... 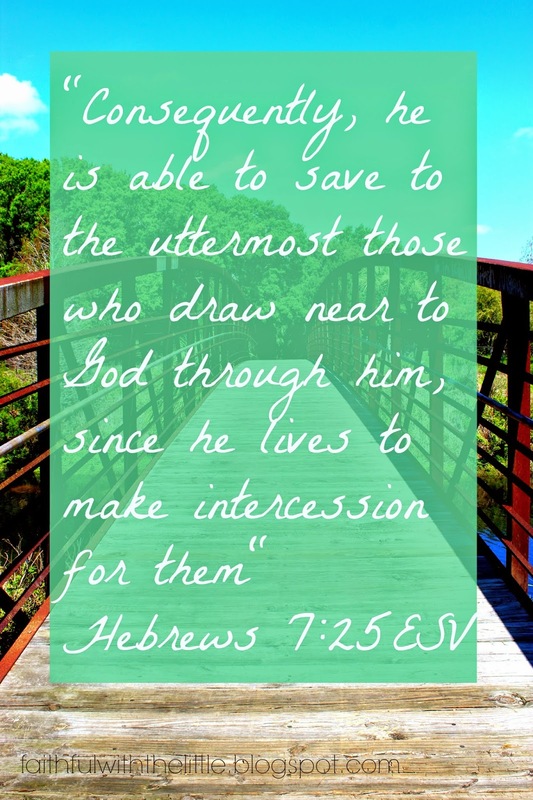 He is able to save to the uttermost! (completely,at all times)...those who draw near to him. When you don't have the faith,when you don't have the strength, when you don't have the words...he is interceding for you. Linking up with these awesome link parties. I am so glad you were encouraged! Thank you for stopping by! What a precious promise from our God who never does things halfway! He's the only One who can save us to the uttermost. May He find us faithful to draw near to Him! Thank you for linking up with us at Grace & Truth. So true. I went through a time when I didn't know what to pray for anymore. I just sit in silence. But I think it is in our silence that God speaks to us more. Yes, sometimes God has to quiet our souls so we can really hear him. So true. So often we don't have the words especially when our hearts are hurting. I've been in that place. But, how wonderful it is to have Jesus standing beside God's throne interceding for us, and the Holy Spirit within us, praying on our behalf. Thanks Rebekah for such a wonderful reminder. Yes! It is so comforting to know and hold on to the truth that he lives to bring us before the Father!